The colorful flags used in the Peking Opera are nearly always an integral part of the elaborate costumes worn by the performers, whose attire must enable the audience to distinguish; at first glance, a character's gender, demeanor, social hierarchy, nobility, and rank. Flags on a character, especially a imperial or a military player have their origins in the small flags Chinese generals would use to signal their subordinates. During the Ming Dynasty (1368 - 1644), Peking Opera troupes enlarged these flags and made them more decorative, producing the trademark flags on the performers back. Curiously the use of symbolic flags in these performances predates the use of a national flag in Imperial China. The Chinese worldview precluded the need for a national flag, as the living symbol of China was the Emperor. The majority of the Peking Opera flags in this Grouping are from the Qing Dynasty (1644–1912) and were acquired in Beijing, their origin date from prior to the 1900s. 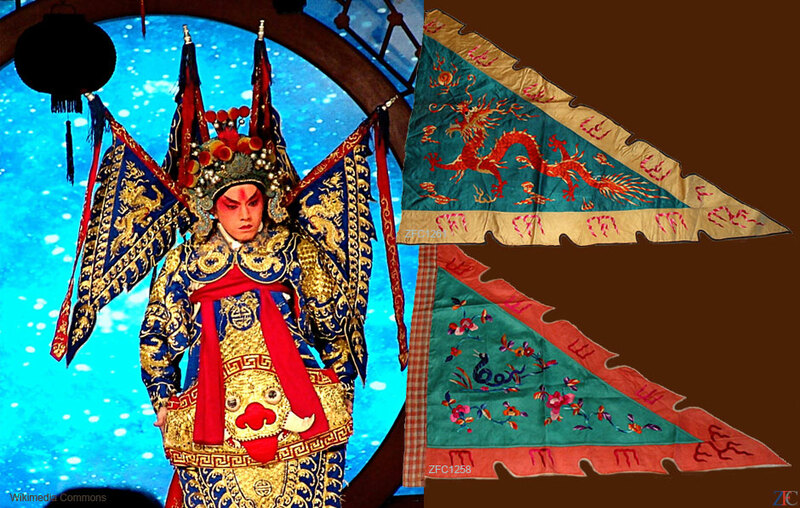 Presented here, in the sequence of the Chinese Zodiac, are silk embroidered flags from a Beijing Troupe of the Peking Opera. Flags of this age and type are rere in China and almost unknown in the West.